Last week was a big travel week for me and I wanted to share a quick tip on something that I packed along. Honestly, when I figured out I was traveling I made up my mind that I would NOT buy a ton of clothing…. actually, I could not is more of the reality. So, I dove deep into my stash and pulled out a few finds. One was this tonal gray stripe. I just love the little flecks of silver lurex running through it. It gives it a bling factor without screaming look at me! But what was I going to make? Well, my travel plans were taking me from the cool Colorado weather to the hot sun of Texas. Which in my book means layers or tee shirts. Bonus, they are easy to pack and I live in them on the average day. Time is always a factor for me so, I knew it had to be a quick sew pattern. Insert the Casual Lady from Go To patterns. Since I had already made the dress version, I knew it would stitch together quickly. With a few quick adjustments to the neckline, I was off to the cutting table! One thing I was super worried about was matching up those shoulder stripes. I thought if I stretched them, it would be a tell tale sign of a home made garment. Insert my secrete weapon and a must have with knits- stay tape. It was game on. Have you used stay tape before? If not, you should totally put it on your radar. It can be your BFF when sewing with knits. Just cut the tape to size and sew seams together like normal. 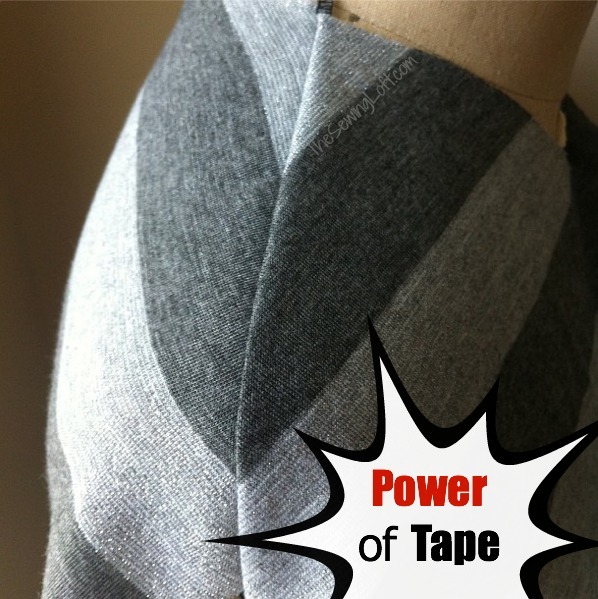 The stay tape will provide an even layer of stability and prevent stretching when sewing. I just love the way my shoulder seams came together. I could not have achieved those perfectly matched stripes without the help of stay tape! ** Disclosure: This post contains links to brands that I am affiliated to, believe in and feel add value to our sewing community. Hello! Are you new to The Sewing Loft? If so, I’m glad you stopped by and hope that something has inspired you to keep your needle moving! Don’t miss a single project and subscribe via email HERE! Bonus- free embroidery pattern with newsletter sign up. Another great way to connect with me is via Facebook, Pinterest, Twitter , Google + or Follow my blog with Bloglovin. I’m looking forward to getting to know you and creating together! What an awesome tip! Thank you! Never to old to learn…stay tape is new to this 80 y/o…thank you so much! Thank you, thank you, thank you! I’ve always been afraid of knit fabric but now, maybe I’ll brave it and make some things I’ve always wanted to try! All I find in the fabric store is “Stitch Witchery” but not “Stay Tape” — what’s the difference? Or is there one? Hello is this tape iron on please? I have found a UK supplier but it is by the yard and so no instructions.